What fuel pressure regulator do I need? 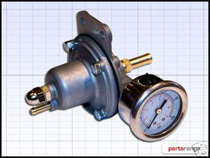 Their are two different styles of fuel pressure regulator that we supply, rising rate and flat rate. Both have individual qualities required by the different fuel injection systems used on the Rover V8 engine over the years. 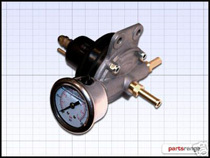 If you have the early Flapper fuel injection system then you will require the rising rate fuel pressure regulator. The reason for this is that this early type of ECU is very primitive and can not be re-chipped to give the gains required by most customers. Therefor the rising rate fuel pressure regulator will increase the fueling through the mid range, where typically lean on the standard fuel map, thus giving the extra fuel required. If you have increased the engines specification of capacity you can also increase fuel pressure accordingly. With the later Hotwire or Sagem fuel injection system the required additional fueling through the mid rev range is done with ECU chipping. In this instance the flat rate regulator is required. This will give you the control over the fuel pressure required, as fuel pressure being to low or high can cause the injectors to dribble or give a bad spray pattern, the fuel will not burn as efficiently as required in these instances. On the latest Bosch Motronic fuel injection system there are no fuel pressure regulators available. The reason for this is that the fuel pressure is controlled at the fuel pump, there is then no need for a fuel return line back to the petrol tank. Suitable for the early Flapper EFi System. Suitable for both the Hotwire and Sagem EFi Systems.